Reminder that training is on as usual tomorrow in both pools 15:00-18:00pm. Head Coach report from Rob Hudson for County competition days 1 to 4 and Leiciester League Round 2 available on the ISC Blog (can be accessed from the homepage of the website). All times for Ilkeston swimmers in the above events in our Members Section of the website (accessed from the main menu off the website). Thanks to Rob for compiling and creating the above content. Well done to all that swam at round 2 of the Leicester Winter League held at Wigston pool. It was another great night for the Club with a second place finish. 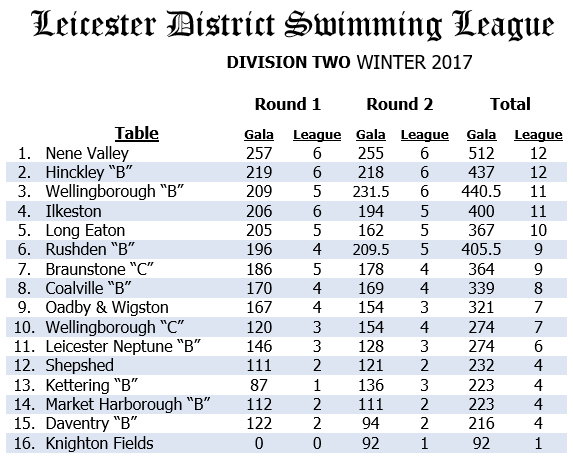 Nene Valley ran away with the gala and looked very strong from the start with 255 points, in second Team Ilkeston with 194 points, in third Braunstone C with 182 points, in fourth Oadby & Wigston with 153 points, in fifth was Shepshed with 120 points and in sixth place was Knighton Fields with 91 points. The starts and takeovers looked a lot more efficient and technically sound, and as usual the underwater skills were far superior to the other teams. Six of the seventeen team relays were faster than round one, and 56 relay split times were fastest on new records. In addition, there were 11 individual personal bests during the gala. Overall, there were a total of 10 first places, 13 second places and 9 third places. So, that is a total of 32 races in the top 3 out of 49 events. Well done swimmers, and thank you to those who helped on poolside! Latest official results for all recent Open Meets and Club Competitions have now been uploaded to the Results section on the website. Thanks to all swimmers, coaches, helpers and supporting families. Rotherham Open Meet 15th & 16th July. The accepted and rejected list is now up on their website. In the Members section – individual times for all Ilkeston swimmers for Leicester League Round 1, Long Eaton Open Meet, Counties Day 1 and 2. In the Results section – Reports and official results for Sports Centre League Round 1, Leicester League Round 1 and Long Eaton Open Meet.